Suzuki Z400 Forum : Z400 Forums > :::Performance and others::: > Maintenance/Repairs/Tuning > Help! Changed timing chain, now wont run! Help! Changed timing chain, now wont run! Bike was running great before i tore her down. 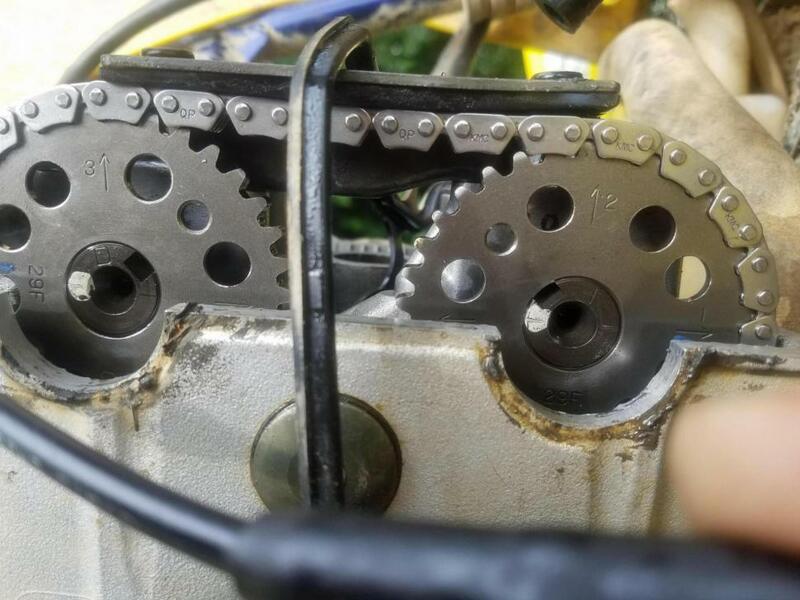 Put a new cam chain in, almost positive my timing is dead on. Slapped it back together, and im getting nothing. Plug is wet, plenty of gas in tank, sparking good, and not even a try to fire. Most i could get was a little "blub" from the exhaust, almost like it was tryn to fire, but not. Im lost, ive i everything 10 times over, from what i understand, there is no way to be 180 out. I timed it with the tensioner out, idk if that will make a diff, but this is what my marks look like. Flywheel on the line next to T. Got my 15 pins inbetween 2 and 3, pretty sure thats about level with the head as it can get. Any help appreciated! I did try the old plug and a new plug, no differenxe either way. Both fuel lines hooked up. Have to keep the chain tight on the tensioner side when installing the cams, but yeah it looks right. What do the cams look like from the other side (the lobes)? Once the cams are set and tensioner installed, turn it over a couple times by hand, set T mark in the hole, and verify cams are correct. You’re lining up the line next to the T (not the actual T) in the timing hole on the crank? Head was off, so new gasket? Yes, compression test would indicate the head not seated right, valve not closing or bent, etc. Valve lash could be bad for a number of reasons. Shim falls out, buckets switched around, etc. Only other thing that comes to mind is pinching a wire or something while pulling the motor or parts off of it. Last edited by jetmech25; 06-28-2018 at 11:43 PM. Btw, thanks jetmech, between your answers on other posts, and on mine, u have helped me quite a bit with this change! All of these didnt fit to perfection, so i kinda guessed between the last size i could get under it, and the next size i couldn't get under it. Guessing valve clearance is the issue? But cams had the same size shim under both valves, and there hot cam shims. Low compression because the one intake valve is being held open? Yep, blows right out the exhaust instead of being held in the chamber. You can swap shims at most shops for free. Might take you a couple trips to get it right. If you go to “tools, advanced search” and look for “valve shim calculator”, you can put in what shims and clearances you have and it’ll tell you what sizes you need. Last edited by jetmech25; 06-29-2018 at 05:34 PM. Anytime! Rather than crushing candy and the other time-wasting things people use their phones for, I come here and attempt to help. I’m no guru and am often wrong, but sometimes not. Glad I could help!